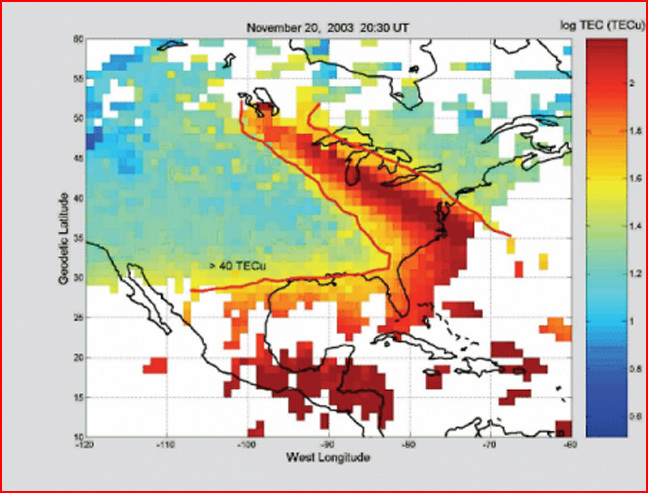 Excess electron density over North America in 2003. Credit: Anthea Coster & John Foster MIT. Atmospheric researchers are puzzled by a "newly discovered form of space weather" observed over the African continent. "...We've seen the smoke, but where's the smoke stack?" Scientists are taking the discovery quite seriously. In Addis Ababa, Ethiopia, over 100 scientists and students have converged this week to discuss the ion plume and its profound ramifications for many scientific disciplines. The electric plumes were first discovered a few years ago over North America, when one appeared during a geomagnetic storm and noticeably affected GPS signals. According to NASA, this was a "plume of excess electron density." The plumes form in Earth's ionosphere, reaching upward into space, for reasons that have mystified atmospheric scientists. For answers, investigators are turning toward Earth's magnetic equator, which passes along the sub-Sahara. The Earth's ionosphere is an outer region of the atmosphere that contains a high concentration of free electrons. Since scientists have observed electrical properties of the ionosphere for more than 100 years, why should they find the plumes' discovery "strange?" Answer: The plumes behavior indicates something that scientists have resisted for many decades -- that the Earth itself is a charged body moving in a plasma medium, and interacting electrically with its plasma environment. In the electric view of the Solar System, the Sun becomes a central player in the electrodynamics of planetary behavior. And exchanges between the Sun and Earth can be seen as the answer to numerous mysteries that have accumulated over decades. This common disregard for electricity has a long history. More than 100 years ago, one of the electrical pioneers, Kristian Birkeland, proposed that the auroras were part of an electrical exchange between Earth and the Sun. But by the middle of the 20th century, traditional dogma in astronomy had virtually precluded that possibility. Then, a few decades later, our satellites detected UNDENIABLE streams of charged particles from the Sun entering Earth's upper atmosphere to provoke the auroras. Until that point, it had been blindly asserted that Earth's magnetosphere must be an impenetrable envelope, "squeezed" by the solar wind, to induce auroral activity. Investigators compare the ion plumes to "smoke billowing out of a factory smokestack," but this analogy is quite misleading. Electrified plasma is not akin to smoke at all. The plumes do not float up and then dissipate like smoke from a chimney. In gravitational terms, the escape velocity from Earth is 25,000 MPH -- not a plausible achievement by a charge-neutral gas like smoke. But charged particles barely notice gravity, if at all. 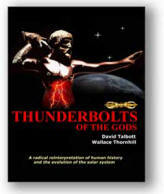 The vastly more powerful electric force rules them. The researchers do recognize the electrified nature of the "gas" (plasma), but are very careful in their choice of words. In fact, the investigators do not offer any explanation for what they are seeing. In an electrically neutral Solar System, no explanation exists, because within this framework, electrical transactions across cosmic distances are inconceivable! What occurred when they first observed the ion plume is this: "â€¦an explosion on the sun had hurled a cloud of magnetized gas -- a CME -- toward Earth. The plume formed when the CME hit, triggering a strong geomagnetic storm. The plume consists of ionized air at high altitude moving from Florida to Canada at a speed of 1 km/s (2200 mph)." It must be emphasized that the mechanical principles of atmospheric circulation will never account for this anomalous transport at such velocities. But in electrical terms, charged particles are not restricted by standard gas kinetics. And in fact, in plasma discharge phenomena we frequently see charged particles accelerated to near light speed. Another science story on the "mysterious plumes" indicates that they may seriously disturb air travel, obviously increasing the stakes for investigators who don't understand how or why the plumes form. The New Scientist news service reports: "Mysterious plumes of plasma at theÂ edge of the Earth's atmosphere are threatening airline navigation by throwing off GPS positioning information by up to the length of a football field. But a poor understanding of how the plumes form means that accurate forecasts of the phenomena -- which would allow GPS users to plan around them -- are years away. "...at least some of the disruptions are due to giant plumes of charged particles, or plasma, that form in response to the solar outbursts in the Earth's ionosphere, a region filled with ions at the boundary between Earth's atmosphere and outer space. The concentrated plasma in the plumes diverts and delays satellite communications, such as GPS signals." We see here a profound illustration of the potential human cost of ignorance. And this ignorance amounts to little more than the momentum of historic dogma, which has excluded electricity from space. To put these new findings in perspective, it is only necessary to see Earth as proponents of the Electric Universe see it. The electrical theorists recognize the Earth as a self-repairing, "leaky" capacitor (a capacitor is a device for accumulating and storing electric charge.) A capacitor is made of two conductors separated by an insulating medium. When charge is placed on one conductor, it attracts charge of the opposite polarity on the other conductor. As a result, an electric field is set up between the conductors, a reservoir of electrical energy. Applied to Earth, this means that the atmosphere serves as the insulating layer between two conductive regions â€“ the solid Earth is the negatively charged region, and the external environment of Earth is the more positively charged region. And the electrical activity of the Sun affects the balance between the two regions. Of course, Earth's atmosphere is not a perfect insulator, and leakage will occur, particularly in response to disturbances from the arrival of "proton storms." 1) The earth, like all of the planets, is a charged body. 2) The Sun has an electric field, and it interacts electrically with the planets. 3) The Sun is not powered by some mysterious, internal "nuclear furnace", but rather externally by electric currents flowing along the arms of the Milky Way. 4) 99.9% of the universe consists of PLASMA, a nearly perfect conducting medium that has been found to exhibit strong electrical properties, almost always ignored by astronomers. All of space is teeming with charged particles. We live in an electrically dynamic universe, a reality confirmed almost daily by "surprising" and "mysterious" discoveries such as the electric "ion plumes" over Earth.